Another mystery character surrounds the title of this week’s Single of the Week, and the reason is probably because it’s Bob Dylan who generally writes songs that leave the listener wondering. Bob Dylan has had 19 UK hits in his own right and 40 that he been sung by other people. Manfred Mann has had the most with four which are; If You Gotta Go, Go Now, Just like a Woman, Mighty Quinn and You Angel You as Manfred Mann’s Earth Band. 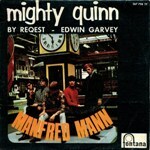 This week we look at the elusive Mighty Quinn. It is possible that Dylan came up with the idea for this after attending a wild LSD party held by the Grateful Dead in a New York City hotel during a tour visit. One of the guests at the hotel didn’t appreciate the noise and voiced several complaints, that guest was actor Anthony Quinn. Dylan learned that Quinn had played an Eskimo called Inuk in the 1959 film The Savage Innocents which could have inspired a partying Dylan to write this bizarre song. The film is also notable as the first screen appearance of Peter O’Toole, who demanded that his name be removed from the film as his entire dialog was dubbed by another actor. There is another theory that circulated at the time which was that The Mighty Quinn was Sheriff Larry Quinlan, who raided the Castillia Foundation land in Millbrook, New York and arrested Dr. Timothy Leary and his group of hippies. Quinlan confiscated all the LSD and other drugs at the scene, in this scenario, the pigeons are informers. Either way, it seems that LSD had some part to play. However, Dylan who never comments much on his song did state in an interview with the Chicago Tribune in 2004, “The song was nothing more than a simple nursery rhyme.” but that article also claimed that the song was named after Gordon Quinn, co-founder of Kartemquin Films, who had given Dylan and Howard Alk uncredited editing assistance on Eat the Document. The song has been famously covered by The Hollies, Leon Russell and Gary Puckett and The Union Gap and even Julie London. It also featured in a 1989 movie of the same name. That film starred Denzel Washington as a police officer named Xavier Quinn and the song was performed in the movie by Sheryl Lee Ralph. Incidentally, the flute intro is played by the German musician and producer Klaus Voormann who had worked with the Beatles and was Manfred’s bassist at the time. In the sporting world, this song was used between 1967 and 1972 by Rotherham United who used to run out to it in admiration of John Quinn, who they signed from Sheffield Wednesday, and the English premiership rugby union club Harlequins F.C. fans refer to their team as the Mighty Quinns when singing the chorus which has been an anthem of the club since the 1990s, In America, the Cork Harlequins Hockey Club play the song in national competitions when they score a goal and it was sung at their men’s Irish Senior Cup win in May 2012, and their ladies’ Irish League finals in 2009 and 2010.